Creamy-textured white beans cloaked in fragrant pesto are offset by the welcome acidity of juicy tomatoes. 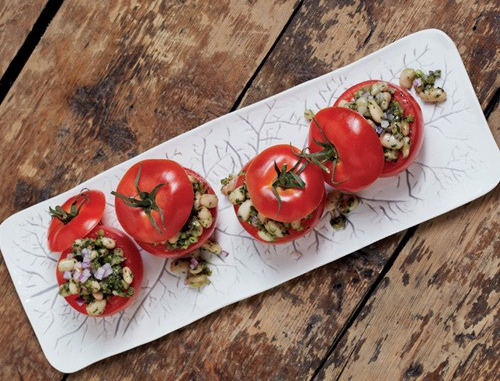 Use perfectly fresh ripe summer tomatoes that are both flavorful and tender for this dish. 1. Toss the beans in a medium bowl with the pesto, salt, pepper, onion, and celery. Taste to adjust the seasoning. Chill for at least 1 hour, or until cold. 2. Meanwhile slice off the top of each tomato and scoop out the pulp with a spoon. Discard. Invert the tomatoes on a plate and allow to drain. 3. Stuff equal amounts of the bean mixture into each tomato. Garnish with the remaining onion. NOTE: You can prepare this dish in advance and refrigerate it, covered, but be sure to remove it 30 minutes before serving. Tomatoes lose their flavor if served cold.